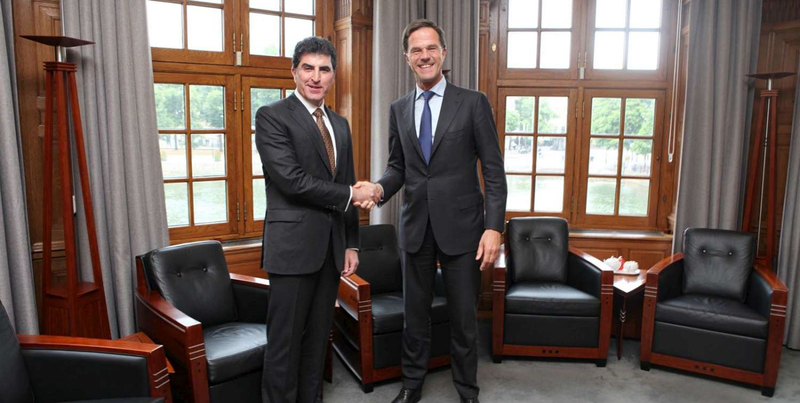 Prime Minister Nechirvan Barzani met Dutch Prime Minister, Mr. Mark Rutte, in The Hague. Prime Minister Barzani highlighted the relationship between the Kurdistan Region and the Netherlands as well as the Dutch government’s assistance to the people of Iraqi Kurdistan since the mid-1970s, when it received a number of refugees from Iraqi Kurdistan. He also highlighted the Dutch humanitarian and military aid to the Peshmarga in the fight against the ISIS terrorist organisation. Prime Minister Barzani thanked Mr. Rutte for his visit to the Kurdistan Region during a time when the Region was facing one of the most dangerous terrorist organisations. This visit, he said, offered a great moral support to the people and government of the Kurdistan Region. He also commended the recent visit by the Dutch Minister of Trade and Development to the Kurdistan Region. Prime Minister Barzani expressed the KRG’s readiness to strengthen cooperation with the Dutch government. He hoped that the Kurdistan Region could benefit from the expertese of the Netherlands in various fields, especially in agriculture. Prime Minister Barzani also gave a brief about the political situation in Iraq, the formation of the new government, the importance of participation and the role of Kurdistan parties in the formation of the new Iraqi government and parliament. He expressed the KRG’s willingness to solve issues with Baghdad through dialogue and in accordance with the Constitution. He highlighted the positive developments between the Kurdistan Region and Iraqi government. Regarding the fight against terrorism, Prime Minister Barzani stressed the need for coordination between the Peshmerga forces, the Iraqi army and the coalition forces in order to eliminate the threats posed by ISIS and finding appropriate solutions to the internal issues of Iraq. Prime Minister Rutte commended the friendly relationship between the Kurdistan Region and the Netherlands and hoped for further strengthening these relations. He praised the role of the Kurdistan Region Peshmerga forces in the fight against ISIS, the people and the Kurdistan Regional Government for accommodating and offering assistance to a large number of IDPs and refugees in the Kurdistan Region. He expressed his country’s readiness to provide assistance to eliminate the threat of terrorism. He also hoped for the settlement of all outstanding issues between the Kurdistan Region and Baghdad.